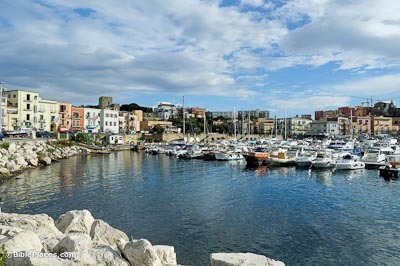 Known today as Pozzuoli, Puteoli was a harbor city located on the north side of the Gulf of Naples, about five miles (8 km) west of Naples. Puteoli is located within the Phlegraean Fields, a caldera measuring 8 miles (13 km) in diameter, most of which is submerged. It includes 24 volcanic craters and other volcanic terrain features. The area is known for a phenomenon known as bradyseism, in which deep subterranean magma chambers fill and empty, causing tremors and earthquakes that raise and lower the ground surface. Paul, and the party accompanying him, stopped at Puteoli en route to Rome. “From there we set sail and arrived at Rhegium. The next day the south wind came up, and on the following day we reached Puteoli. There we found some brothers who invited us to spend a week with them. And so we came to Rome” (Acts 28:13-14, NIV). Puteoli’s importance owed to the security of its harbor and the lack of any decent harbors closer to Rome. 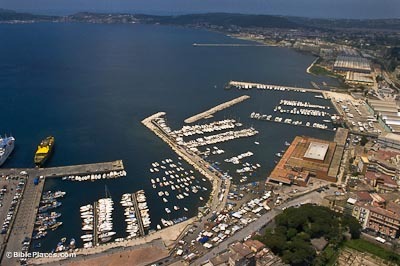 In fact, until the construction of the harbor at Ostia by Emperor Claudius (AD 41-54), Puteoli was the main harbor for the city of Rome, even though Rome is about 170 miles (272 km) away. Much of the commerce from Egypt and Palestine passed through Puteoli on its way to Rome. With the completion of Ostia’s harbor in the reign of Trajan (98-117), commercial traffic was then diverted to the mouth of the Tiber River. There were two amphitheaters at Puteoli. The one pictured here is from the reign of Vespasian (69-79), known as the Flavian amphitheater. 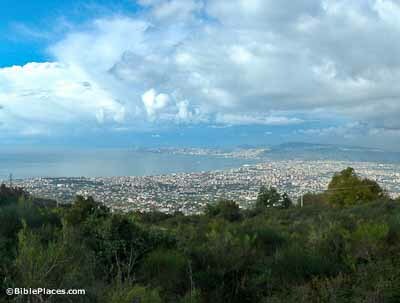 It had room for up to 60,000 people and is the third largest in Italy. 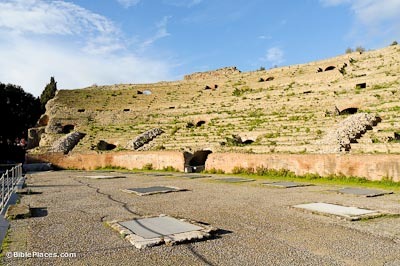 The amphitheater is well preserved and measures 490 by 545 feet (149 by 166 m). An earlier one was built around the time of Nero (AD 54-68), the remains of which are about 300 feet (90 m) northeast of the Flavian amphitheater. The Roman forum dates to the 1st century AD. 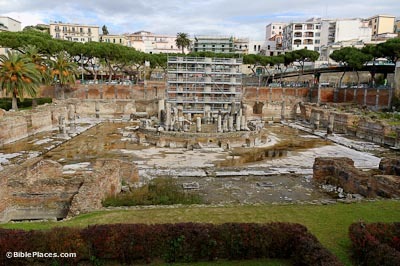 It was originally misidentified as the Temple of Serapis because a statue of the Egyptian god was found here. This statue along with other evidence from the city suggests that several different deities and religions characterized the worship of the city’s inhabitants. The forum measures 148 by 190 feet (75 by 58 m). In the center of the forum was a tholos, and on the northeast side was an apse with four large Corinthian columns, three of which are standing. Remains of smaller granite and marble columns can be seen standing around the edge of the courtyard. 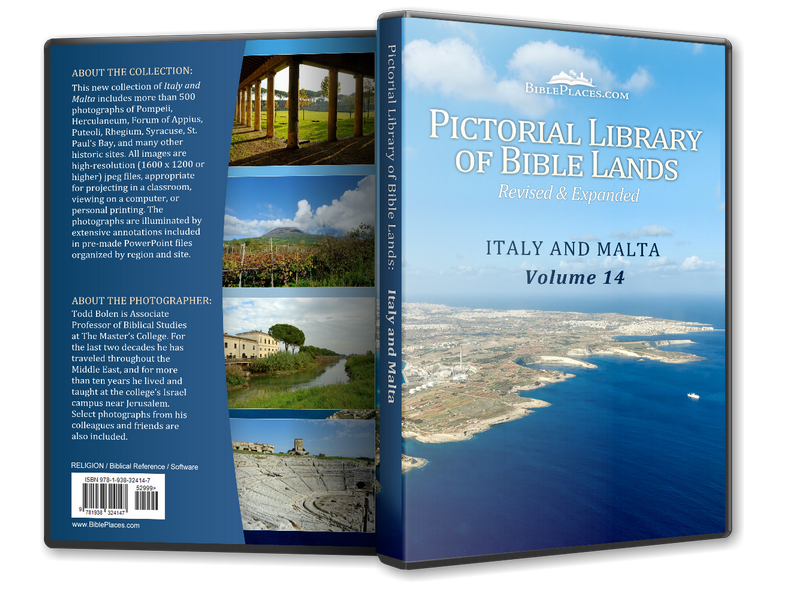 Download all of our Italy and Malta photos!